Tripp Lite's Protect It! SUPER6OMNI D offers economical AC surge suppression for full protection of 220-250V workstations, desktop PCs, telecom systems and other sensitive electronics. Built-in AC surge suppression shields connected equipment from damage and performance problems due to transient surges. 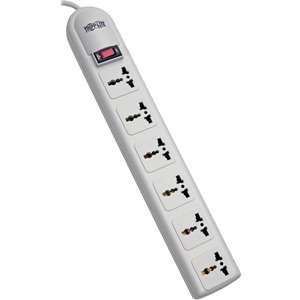 The SUPER6OMNI D offers 6 universal outlets and a 1.8 meter AC line cord with German/French plug. AC suppression rated at 750 joules shields equipment from surges and line noise. 2.5" x 1.3" x 15.5"